If you've witnessed a proliferation of style insiders going selfie-mad wearing plain white shirts styled in myriad ways, then you probably know a vital piece of current fashion information: It's Equipment's 40th anniversary. Back in the mid-'70s, Christian Restoin (as in Carine Roitfeld's husband) establish a très cool, très simple brand that was bound together by the ethos of perfectly cut menswear-inspired shirts. The A-listers came rolling in, and Equipment's button-downs became something of a wardrobe legend when Restoin moved onto his next project two decades later. The brand lay dormant for some time until Serge Azria—surely one of the most influential men in a now-booming Californian fashion hub—relaunched the concept in 2010. It has since expanded by gargantuan proportions, maintaining its core offering as well as introducing other popular items such as pyjamas, slip dresses and cashmere sweaters. There's a fresh wave of super-fans to boot—not to mention a much-lauded collaboration with Kate Moss. Equipment is still very much the backbone of many a chic wardrobe across the world. 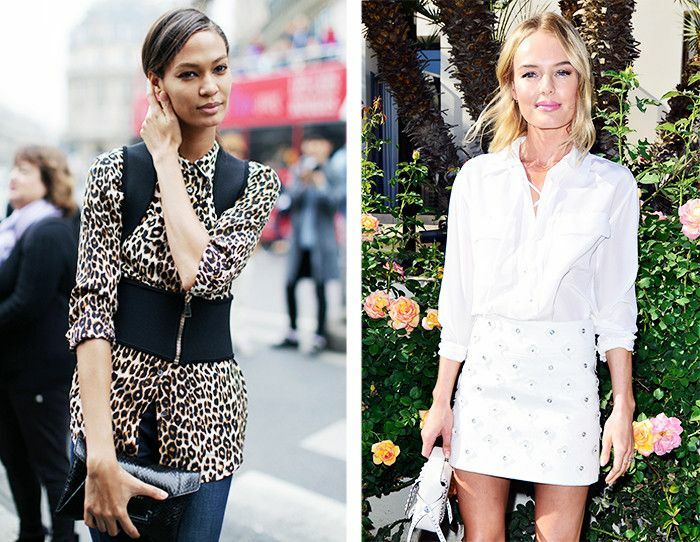 Joan Smalls and Kate Bosworth are just two of the high profile Equipment fan club. "Two years after it all started, I didn't know anyone, celebrity or otherwise, who didn't own an Equipment shirt. I remember retailers flying back to Paris just to ship boxes worth back to the States," says Equipment's creative director, Serge Azria, of the brand's beginnings. "Equipment was, for its two-decade span, the Levi's 501 of buttoned shirts: easy, cool, classic—a wardrobe staple." Taylor Tomasi Hill celebrating the brand's 40th anniversary on Instagram. A close-up of Shayla's mood boards. "I have an ongoing, seasonless concept wall that I add to whenever I notice myself gravitate toward a look, fabric, colour…" explains Shayla. "Usually small stories will form within the images I collect from magazines, blogs, runway, and friends, and I use that to create a print story and mood." "For spring 2017, I referenced the melancholy of an abandoned greenhouse to modernise pretty watercolors, an urban garden setting for vibrant daisy camouflage and pop florals, and also California's Salvation Mountain for '60s desert conversational prints." Don't know what a conversational print is? It's something unexpected and unusual, like quirky motifs. Think tropical bananas or illustrated birds. Shayla in the Vernon HQ wearing one of her go-to blouses. Shayla's pick for "Equipment girl" for 2017? "That’s a really tough one, but right now I have photos everywhere of Lily-Rose Depp. She is so poised and cool at the same time." With so many pieces on offer, there are plenty of women who will find the right piece for them, says Shayla. "No matter your proportion or preference, there is something to suit you. Personally, I like playing around with sizing down in the more masculine silhouettes for a shrunken boy look. Try a large, and wear it as a tunic or as a dress—open almost like a kimono… There are so many ways to customise." Behind the scenes of the pattern-cutting and fitting process. "I am insufferable in the area of fit and construction. In a way, you really must be obsessive, because it makes all the difference in the final product. In each fitting session, my focus is on the wearer's experience. I want to see how the garment drapes when you walk, how it looks buttoned all the way up as well as unbuttoned, how it feels when you put a jacket on over it…"
Of course, Shayla has her personal preferences: "You will see me in anything pyjama-inspired most of the time!" From precise print decisions to tiny fit tweaks, no shirt-related stone is left unturned. "Whether it's a menswear stripe, an animal print or our newest shape of a white silk shirt, the customer loves items that are seasonless. I really think about what small detail or twist could make something very classic feel completely new," says Shayla, noting that elements that appear off-brand would include "anything that's too beat up or worn-in looking; also, prints that are very cute and sweet." Right now it's less about the chosen shirt and more about how it's styled: "Many girls are sizing up for a very slouchy look tucked into denim, which I love," she says. "Also, sometimes styling them as more of a shirt jacket, unbuttoned and over a vintage tee." The production line in California. "I am designing a year in advance, and the assortment includes about 50 shirts per month!" The process from first design to a final product takes about 10 months she says. "Each styles goes through many phases and so many talented hands before anyone sees it." With over 200 staff housed in the parent company's building (Joie and Current/Elliot within this group), it's a big operation. But when it comes to creating a modern wardrobe staple that so many thousands of women rely upon, it's no great wonder. Next up, the S/S 17 trends you need to know now.